Create stunning, creative and stylish videos using VideoMagix With VideoMagix you can turn your videos into creative masterpieces and share them with your friends and family on Facebook.### Features ### ◆ Edit a single video or combine many to create a compilation.◆ Adjust the speed of your video to create a Slow Motion effect.◆ Add filters and special effects to improve your video appearance.◆ Add sound or music to your videos.◆ Edit Videos From Your Camera Roll - You can edit videos stored in your camera roll by importing them into the application. ◆ Share Your Videos On Facebook - Want to impress your friends and family? After editing your video why not connect and upload it directly to Facebook. ◆ Tons Of Great Filters Included - Enhancement, Black & White, Sepia, Cartoon Poster, Black and White Vintage, Sketch and more! ◆ New Filters - New filters added in updates. 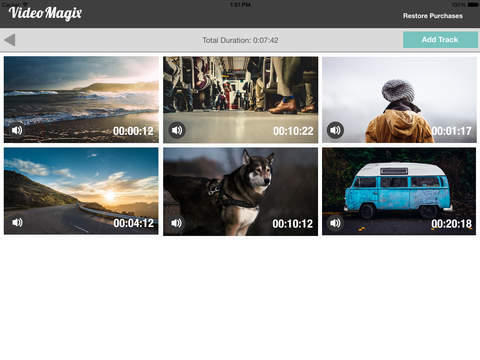 ◆ Simple To Use - VideoMagix HD is designed to make video editing simple and fun. ◆ Fast Video Editing. ◆ No Time Limit - No fixed time limit on your videos.